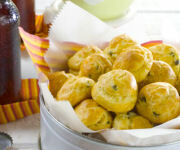 Fill prepared popover roll pan or muffin pan with batter. Place in cold oven; turn oven to 425 F. Bake 35 minutes for a popover roll pan or 30 minutes for a muffin pan, without opening the oven door, or until popover rolls are high, have golden brown tops and are crusty when tapped. Remove popover rolls from oven; turn onto wire rack. Pierce sides with paring knife to let steam escape. Cool slightly and serve while warm.